Pakistan Vs Sri Lanka 5th ODI Today Match Prediction 23 October Monday 2017. Who Will Pakistan Vs Sri Lanka 5th ODI match? Get the score of today’s cricket match. Pakistan has already won the series by 4-0.Pakistan is performing really well in the ODI,s since the champions trophy. Imam-ul-Haq the debutant scored the century in his 1st game and played an important role in the victory of Pakistan. Hassan Ali took 3 wickets, he becomes the fastest Pakistani to took 50 wickets. Sarfraz is much confident for the clean sweep. In the 4th ODI Match: man of the match has been awarded to BABER AZAM for his 69 runs in the winning cause. You can get today match prediction from this great platform free and this match of Pakistan Vs Sri Lanka 5th ODI match is on Oct 23, 2017. Today Pakistan Vs Sri Lanka 5th ODI will be playing in Sharjah. These teams have extraordinary players and both teams are looking well balanced. 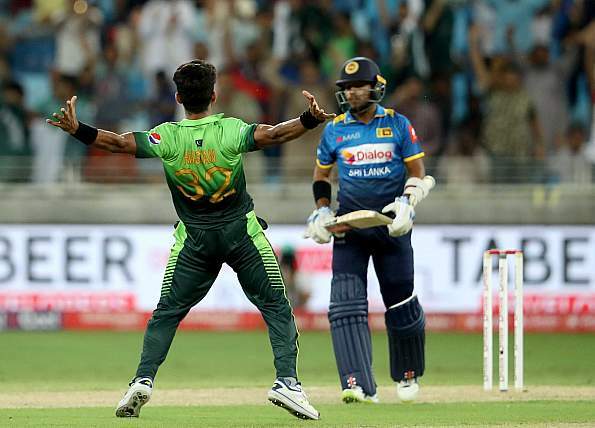 Here we are providing on this sure shot cricket prediction site today Pakistan Vs Sri Lanka 5th ODI cricket match prediction. Get Today cricket match tip, cricket prediction, cricket predictions, accurate cricket tips, of Pakistan Vs Sri Lanka 5th ODI and live score ball by ball. Venue – Sharjah Cricket Association Stadium, Sharjah(3:00 PM). Sarfraz Ahmed(c&wk), Hassan Ali, Fakhar Zaman, Shoaib Malik, Mohammad Hafeez, Ruman Raees, Shadab Khan, Imam ul Haq, Babar Azam, Faheem Ashraf, Junaid Khan, Ahmed Shehzad. Dinesh Chandimal(c), Niroshan Dickwela(wk), Rangana Hearth, Suranga Lakmal, Kaushal Silva, Dilruwan Pareera, Nuwan Pardeep, Dimuth Karunratne, Vishwa Farnendo, Lakshen Sandkan,Lahiru Gamage, Sadeera Samarawickrama.